Behind the brushstrokes of my Chinese calligraphy is a profound respect for the ancient symbols that Chinese characters represent within the collective psyche of mankind. Serving as personal apprentice to Grand Master painter and calligrapher Liang Zongheng in Nanjing China, I studied Chinese art history and philosophy, poetry and painting, culture and craft, and the tools and techniques of Chinese calligraphy. Master Liang gifted me with the rich tradition passed from master to apprentice by honoring me with the name Mo Feisheng - Voice of Flying Ink. I have exhibited my artworks extensively throughout the USA, Canada, China, and Australia. 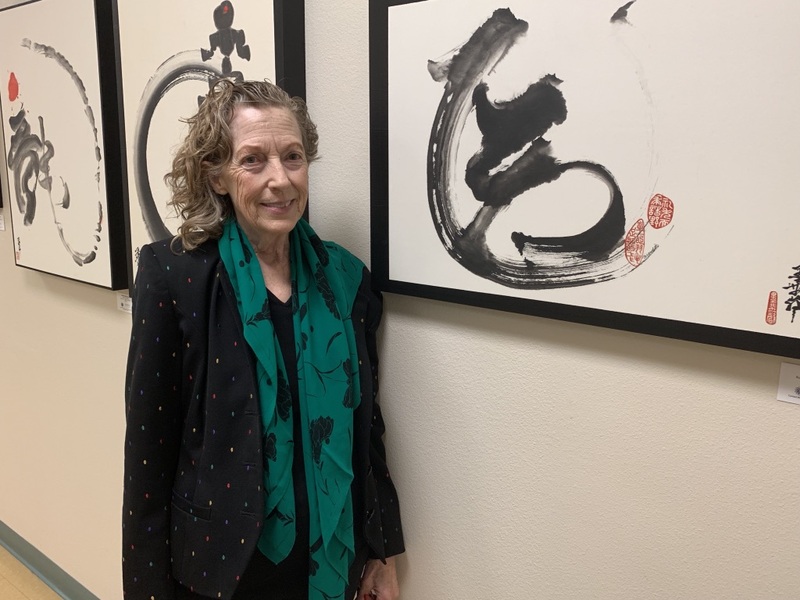 Currently living in Rio Rancho New Mexico, I continue studying Shang Dynasty Oracle Bone Inscriptions and paint with a symbolic focus on contemporary Zen-inspired brushed ink calligraphy. Brushing simple strokes in black ink on white paper transcends years of study, animating traces of ink with personal energy ultimately transferred to the custody of viewers, who reinterpret the images through their own psyches. The Tree of Life is a symbol. Symbols are the Tree of Life. Across cultures and the centuries, symbols permeate and animate creative artistic expression. Grounded in primal images rooted deep within the human psyche, symbols branch out in patterns reflecting the profound diversity of human nature itself. I recognize my own human nature and find artistic voice in the rich symbolism infusing Chinese calligraphy with a life force at once universal yet deeply personal. From antiquity to modern day, the Chinese written language has sustained a vast repertory of symbolic imagery. Chinese calligraphy resonates like a drum beating from the remotest regions of our collective unconscious. It touches within us a sympathetic chord pulsating with images and ideas both intimate and infinite. Responding to the vibrant calling of Brush, Paper, Stone and Ink – the Four Treasures of the Studio – has enriched my creative spirit and summoned great change in my life’s direction. Going out on a limb in the mid 1990s, I left my job at the Smithsonian Institution in Washington D.C. and moved to Nanjing China to study the ancient art of calligraphy with Master Liang Zongheng and Professor Chang Guowu. Professor Chang taught me the Yang: to diligently seek knowledge in Chinese art history and philosophy, poetry and painting, culture and craft, in tools and techniques. To be full. Master Liang showed me the Yin: to forget intellectual knowledge, to be flexible and hollow like bamboo, to plunge deep like a taproot intuiting the Source. To be empty. A name renders rich symbolic influence upon an artist’s signature. Master Liang honored me with the name Mo Feisheng – Voice of Flying Ink. Brushing ink on paper enables me to interpret the universal language of symbols with a personal voice. Traces of black ink flying across white paper express the very essence of the Yin and the Yang. Though sublimely filled with an artist’s distinctive mark, Chinese calligraphy remains empty and open to reinterpretation by the viewer. It is empty; it is full. Like the Tree of Life. In a name, in a symbol, an idea, an expression; there are roots, there are branches. There is nothing superfluous, nothing lacking.